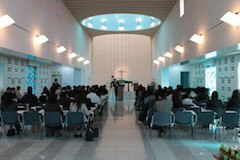 The International Course at Gyosei provides students with a fully bilingual education. Students study in both English and Japanese, and learn how to live and work in both languages. Faculty in the International Course are native speakers of English, from the United States, Canada, Australia and other English speaking countries. All homeroom teachers in the International Course are native English-speakers. As much as possible, all interaction with the students is in English. Students in the International Course graduate from the Senior High School with a Japanese diploma. Many students from the International Course have gone abroad for their higher education after completing the Senior High School. The bilingual education provided in the International Course is an excellent preparation for what can be a very difficult transition. As all staff members in the International Course are form English-speaking countries, they are able to give students advice about the colleges and universities in their home countries.